Allen Lewis began his formal education as an artist under George Bridgman at the Buffalo Art Student's League. He later studied under Gerome at the Ecole des Beaux Arts in Paris. After several exhibitions at the Paris salons, he returned to the United States to teach wood-engraving, color printing, etching and illustration. He was an instructor at the Art Student's League in New York for eight years, and later was associated with the New School for Social Research. 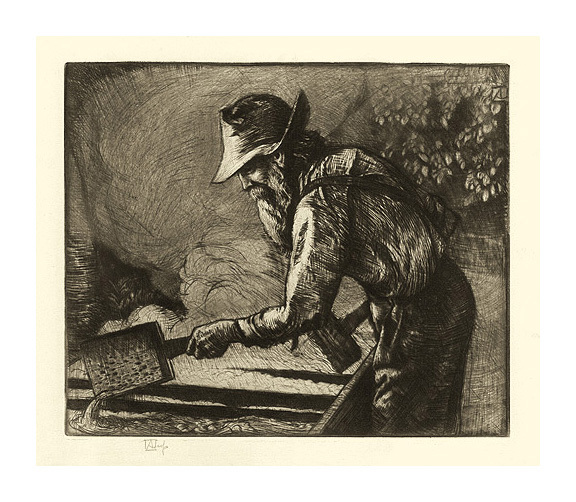 He was a member of many arts organizations including the National Academy, the Society of American Etchers, and the American Institute of Graphic Arts. the Bijur prize from the Society of American Etchers, and the Agar prize from the National Arts Club. 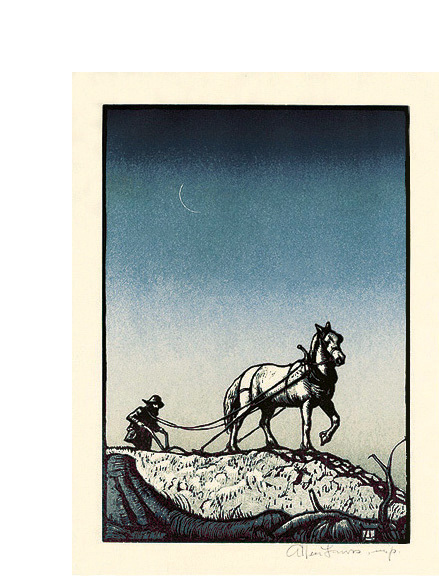 In addition to printmaking, Lewis' oeuvre includes the illustration of several books; among them Undine, Journeys to Baghdad, Paul Bunyan, Walt Whitman's Short Stories, Petronius, Ivanhoe and Jesus Christ in Flanders by Honore Balzac. He was also a contributor to and illustrator for Bookplate Annual. His work is represented in the collections of many major international museums and institutions, including the Metropolitan Museum, the British Museum, the Bibliotheque Nationale (Paris), the Brooklyn Museum, the Art Institute of Chicago, the Cleveland Museum, the Detroit Institute of Arts, the Yale School of Fine Arts, Harvard University, the Prague Museum and the New York Public Library. 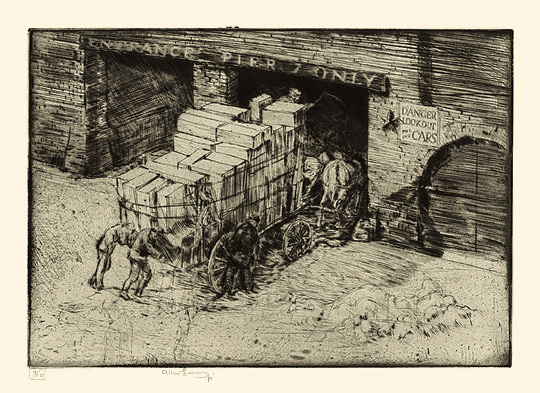 The Load - - c.1895, Etching. Edition 50. Signed and numbered 9/50 in pencil. Image size 6 15/16 x 9 15/16 inches (176 x 252 mm); sheet size 9 5/8 x 12 9/16 inches (244 x 319 mm). A fine, rich impression, on chine collé, with full margins (1 1/4 to 1 3/8 inches). Pale light toning within a previous mat opening, otherwise in excellent condition. 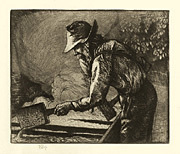 Boiling Down the Sorghum - - c.1920, Etching. Edition not stated. Signed with the artist's monogram in pencil and in the plate, upper right. Image size 6 11/16 x 7 15/16 inches (170 x 202 mm); sheet size 7 15/16 x 11 1/16 inches (202 x 281 mm). A superb, richly inked impression, in warm black ink, with selectively wiped plate tone, on chine collé; with margins (1/2 to 1 5/8 inches), in excellent condition. 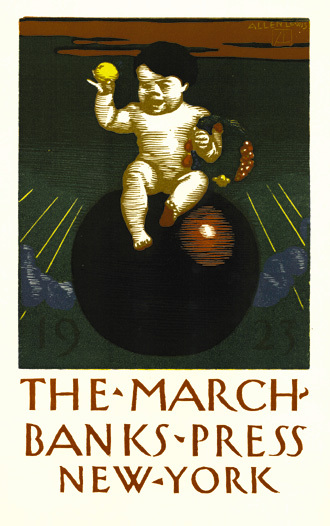 New Year's Poster for Marchbanks Press, 1923 - - c.1922-23, Color Woodcut. Edition not stated. Signed in the block, upper right. Cut in the block THE MARCHBANKS PRESS NEW YORK in rust ink, below the image. Image size 10 1/4 x 8 1/2 inches (260 x 216 mm); sheet size 17 1/2 x 11 11/16 inches (445 x 297 mm). A fine, fresh impression with full margins (1 9/16 to 2 1/16 inches) on cream wove paper, in excellent condition. Twilight Toil - - 1943, Color Woodcut. Edition 200. Signed in pencil. Signed with the artist's chop in the block, lower right. Image size 10 x 7 inches (254 x 178 mm); sheet size 12 5/8 x 9 3/8 inches (321 x 238 mm). A fine impression, on cream wove paper, with full margins (1 1/8 to 1 3/8 mm), in excellent condtion. An impression from the edition published for the Presentation Print of the Woodcut Society, 1943. Printed by Torch Press, Cedar Rapids. Complete in the original Woodcut Society letterpress presentation folder, with a forward by the artist. Illustrated in James Swann: In Quest of a Printmaker, Czestochowski, 1990. Collections: Art Gallery of New South Whales, Wheaton College.